In our last blog post, we discussed some of the most important items on your packing list, from getting rid of things you no longer need and staying organized to getting the right packing materials and using a professional packing service. 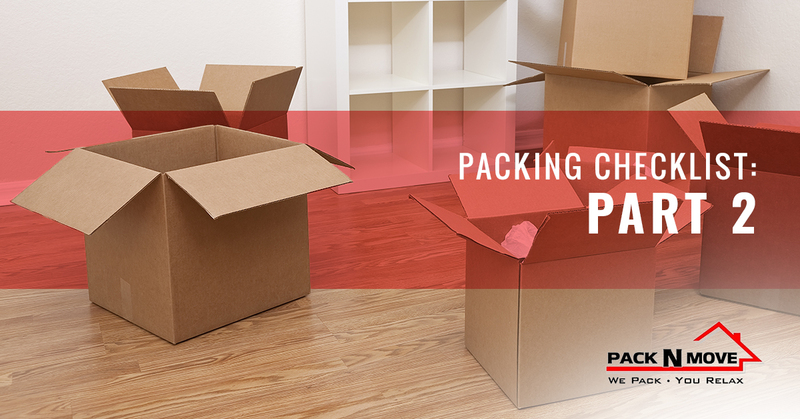 As it turns out, there is much more to packing to move than simply putting things in boxes, so continue reading for more packing checklist items from our experts at Pack N Move in Visalia! When packing to move, it is important to ensure that your valuables and necessities are packed separately so you know their whereabouts at all time during the move. Things like birth certificates, social security cards, passports, medical documents, and family photos pose a nightmare if misplaced or damaged, so keeping them with you at all times is a must. Place them together in some kind of waterproof file organizer, then place it in a packing box for moving, seal it with strong packing tape, and pack it in your personal vehicle rather than the moving truck. Hand in hand with keeping your valuables close is remembering to keep your moving day necessities easily accessible during the move. Whether you’re moving across the country or within Visalia, we guarantee that you’ll want toiletries, a change of clothes, snacks, and necessary medications within reach. The last thing you want is for your toothbrush to vanish mid-trip or for your kids to have a blood sugar crash — or even worse, for your personal vehicle to get a flat tire when you’re moving in the middle of winter when your sweatshirts are packed away with the rest of your cold-weather clothing. Even those who have relocated many times over the course of their life require help packing and moving specialty items like pianos, antiques, furniture, major appliances, and artwork. These things are best left to professional packers who have years of experience maneuvering such cumbersome and/or delicate things, and more often than not, it just isn’t worth the gamble of doing it yourself. Trust us, nothing will add stress to your move like having a refrigerator fall on you or dropping a piano down a flight of stairs. Not only are these things incredibly heavy and difficult to move on your own, but they are expensive or even impossible to repair if damaged during a move. This is especially true for musical instruments, sculptures, and antiques — these items are often one-of-a-kind, extremely valuable, and require special care. That’s why you should set aside specialty items as part of your packing checklist so the moving company can pack and move them safely. Getting ready for the big move? Contact our professional packers at Pack N Move in Visalia to get started, and keep an eye out for our future blog posts with packing and moving tips!